The Zea mays leaf is another example of a C4 plant. Note the very prominent bundle sheath, (BS) with large, centrifugally-arranged chloroplasts, surrounded by a radiate Kranz (wreath-like) mesophyll (KMS). Large metaxylem vessels (M) are separated from each other by the protoxylem (PX). The Phloem (P) lies beneath the xylem. Study the diagram to the left. 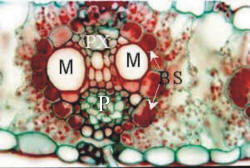 Notice that the vascular bundle is dominated by two large metaxylem elements. It will help you to identify the layers associated with this vascular bundle and also the photosynthetic compartmentation that is a structural requirement for C4 photosynthesis. Question: Does the structure of the vascular bundle in the stem look the same as this? If not, think of reasons why this is not so.